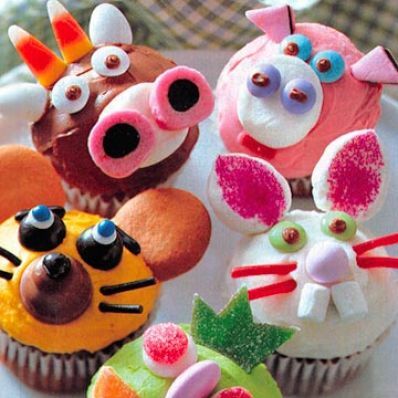 Use your imagination to decorate these chocolate cupcakes with candies to resemble barnyard animals. For a fun party activity, provide frosted cupcakes and let the kids create their own treats. 1 of 4 Heat oven to 350 degrees F. Line 24 medium-size muffin-pan cups with paper liners. 2 of 4 Mix flour, cocoa, salt, baking soda and baking powder in bowl. 3 of 4 Beat butter, sugar and vanilla in large bowl until light and fluffy. Add whole eggs and whites, one at a time, beating well after each addition. Alternately beat in flour mixture with milk, beginning and ending with flour mixture. Spoon scant 1/4 cup batter into each prepared muffin cup. 4 of 4 Bake in 350 degrees F oven for 25 minutes or until wooden pick inserted in centers comes out clean. Remove cupcakes to racks to cool. 1 of 2 Beat butter or margarine, in medium-size bowl with electric mixer until fluffy. 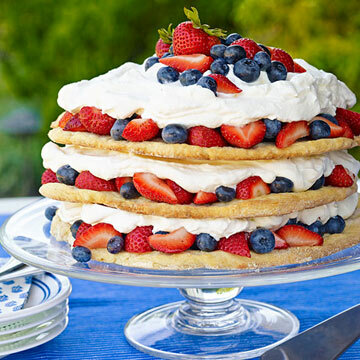 Gradually beat in sifted confectioners sugar alternately with milk and vanilla until smooth and good spreading consistency. Beat in pinch of salt. 2 of 2 Frost cupcakes, tinting batches of frosting with food coloring for desired colors. Decorate tops of cupcakes, using candies.